How does maintenance backlog get out of hand? You may have heard the news—it’s really nothing new. The National Parks Service (NPS) has racked up $11.9 billion in maintenance backlog. And since Congress only allocates about $3.25 billion a year for such work, it’s been deferred indefinitely, a seemingly insurmountable mountain of maintenance that’s unlikely to be completed without radical intervention. These unfilled work orders include crumbling memorials and roads managed by the NPS but also privately owned hotels, gift shops, and other concessions, which adds layers of complexity to an issue that’s been percolating for years. We’re not going to delve into those complexities here—others have done that already. What we are going to talk about is what exactly maintenance backlog is, how it happens, and how an organization gets to this point. Maintenance backlog is work that needs to be completed for safety or operational reasons to avoid further asset breakdown, that just hasn’t been done yet. What is the right amount of backlog? Maintenance teams can’t be everywhere at once, so some maintenance backlog is unavoidable and expected. But it’s important to figure out the appropriate level of backlog in relation to your industry and business needs. The ideal scenario is a backlog that is stable and controllable, even if your organization is hit with a record number of emergency breakdowns. Maintaining a balance between resource allocation and the costs associated with maintenance is essential. Controlling maintenance backlog is really difficult without the help of a computerized maintenance management system (CMMS). A CMMS helps maintenance managers get a grip on what work needs to be done and when, by giving them full visibility on backlog. It also keeps maintenance top of mind and doesn’t let small projects fall through the cracks. Click here for a detailed article on calculating maintenance backlog, from Plant Services. 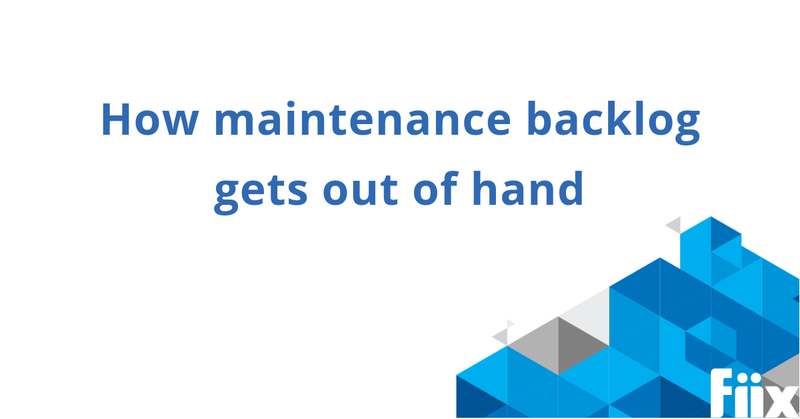 However, tracking maintenance with a CMMS alone isn’t enough to avoid backlog. The National Parks Service has a CMMS. According to their website, they’ve been using maintenance software since 1986, with the current version of their facilities management system deployed in 1998 and “modified over time to meet NPS’s unique needs for an asset management system”. So how does maintenance backlog get out of hand? Context, as well as the level of risk associated with each asset determines the level of backlog that’s acceptable: Low risk assets tolerate longer maintenance backlogs, while high risk assets tolerate shorter maintenance backlogs. But regardless of the asset risk level, backlog can result in equipment failures, non-compliance with mandatory safety requirements and statutory safety legislation, costs to remove and replace assets, production losses, and warranties that don’t hold up in court—all of which can lead to bigger price tags down the line. The NPS situation illustrates just how easy it can be to let maintenance fall to budget constraints. By continually deferring preventive maintenance you run the risk of letting small fixes turn into large, expensive projects that your budget simply can’t keep up with. In July of 2013, the Committee on Energy and Natural Resources held a hearing to consider supplemental funding options for the NPS maintenance problem (which, at the time was only $11.5 billion). During the hearing, Senator Tom Coburn brought to light the danger of ignoring preventive maintenance. “Because every year you don’t do preventive maintenance, you get behind the curve. Then pretty soon now, you’re replacing a road rather than resurfacing,” said Coburn. He went on to point out the vicious cycle that underfunding from Congress coupled with the existing backlog was creating. The NPS is an extreme example. It’s a massive organization with major infrastructure projects that spans the entirety of the US, and it’s not a stretch to see how a bit of backlog can have such severe consequences. But it’s a good cautionary tale that illustrates how easily maintenance can get out of hand. A few deferred jobs that fly under the radar can build up, and eventually result in much more extensive repairs. And once you fall behind on maintenance, it can be incredibly difficult to catch up. Your first line of defence against this kind of cataclysmic work order buildup is not only using a CMMS, but implementing a maintenance strategy that lets you stay on top of repairs and monitor your maintenance activities, to spot backlog before it gets out of hand.